For information on sponsoring a workshop contact Sahina at sahina@sahinabellydance.com or 413-595-1119. This workshop will teach you techniques for playing zills while doing traveling steps and floor patterns including how to match your steps to the time signature of the music, and matching zill patterns to the steps and beat. Techniques will be put into practice with dance combinations and accompanying zill patterns. If you ever feel like your movements are limited when you put on zills this is the workshop for you. We will cover exercises to coordinate your hands, arms, and body allowing you to become as comfortable dancing with zills as you are without. Several arm paths and frames will be taught to embellish your dance as you are learning to accentuate the rhythm with your zills. We will work with a variety of time signatures and learn zill patterns and dance combinations to accompany several rhythms. Arm carriage is key to polishing the look of your dancing. This workshop will teach you graceful flowing arm combinations to complement, accentuate, and frame your dance as well as exercises to strengthen your arms and hands. We will consider how different varieties of arm paths impact the overall look of your dance and apply the concepts to a dance combination that will utilize a variety of beautiful arm paths and positions. Looking for the chance to build up your shimmy stamina? Want to add more excitement to your dance with layering? The key to crisp, strong shimmies is building abdominal stamina and muscle control. In this workshop, Sahina will take you through some exciting combinations of abdominal locks, pops, and stomach work, adding various shimmies to help you add intricate layers to your dance practice and performance. Get ready for your next drum solo with this vigorous and action-packed hour and a half! Be ready to shimmy and sweat! This class will focus on the lovely and classical art of floorwork within the context of Vintage Oriental and Turkish bellydance stylizations. Students will learn graceful and seamless level changes as well as sinuous floor combinations utilizing core strength, body lines, and isolations in new ways. Veil is a beautiful and essential component to the Vintage Oriental style routine. In this workshop we will cover several different veil wraps and ways of elegantly dancing out of the wrap. We will cover frames, spins, and draping techniques with special attention to grace and fluidity throughout all stages of the wrap. We also work on becoming aware of how our hands interact with the veil to become more comfortable dancing through the various stage of unwrapping. The veil techniques learned can be applied to other styles of veil dance and will ultimately give you more confidence dancing with this beautiful prop. In this workshop we will focus on building strong abdominal technique covering both smooth abdominal isolations like belly rolls and sharp isolations including pops and locks. We will work on strengthening, muscle control, and transitioning between isolations. Combinations will be taught to provide ideas for integrating stomach work into your dances to add intricacy and interest. Home practice is a vital component to any bellydancer's training, but we often have difficulties finding time in our daily life to dedicate to dance. Sometimes, we find the time for personal practice but struggle with trying to figure out how best to advance our dance. If you can relate to this: don't worry -- you are not alone! In this workshop Sahina will help students focus on defining ways to work on different aspects of dance during home practice. Topics covered will include drills for footwork, arm carriage, layering, transitions, and strengthening. We will also discuss how to build a practice regimen that will fit into your schedule. Need help brainstorming drills for a specific need? Bring your questions and requests to class! Learn to gracefully transition between movements, tempos, and stage positions while working to develop the isolations needed to dance while balancing props. Working with live music is one of the greatest joys for a dancer, it brings us to our roots as improvisational performers responding to music in the moment. In this workshop we will dance our way through basic music theory learning to feel the pulse of the music and recognize common rhythms and rhythmic variations while working on ways of expressing these rhythms through dance. We will focus on analyzing music on the spot and the use of combinations and improvisation exercises to become comfortable freely responding to live drum solos. A deeper understanding of the music will allow you to connect with the drummer and the music being created. This class will be co-taught by Sahina and Amanda Turk and we will dance to live music throughout the class. This workshop will be a little bit of everything- musicality, music theory, dance improvisation, and history. We will work with 2 or 3 different instruments, including qanun, viola, and oud, with live musical accompaniment by Dan Muscat. For each instrument we will discuss its history and context within Middle Eastern music and culture, as well as its musical range. Understanding the instruments we dance to will help us as dancers to respond to the variety of sounds, moods, and emotions they convey. We will use dance improvisation exercises for hearing and responding to each instrument's unique flavor so that we can reach our goal as dancers of being the embodiment of the music we hear. This workshop will provide a unique opportunity to hear perspectives on these beautiful melodic instruments from the perspective of both a dancer and a musician. In this workshop we work on building connections between drummers and dancers by teaching dance and drum technique simultaneously. 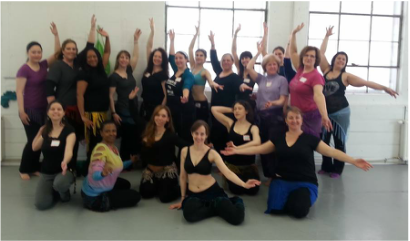 We will explore common rhythms and rhythmic variations and each participant can focus on learning bellydance or drumming with doumbeks or frame drums. This will allow dancers to get practice dancing to live music and drummers to practice playing music for dancers. Drummers will start out with basic hand technique and then move on to a few traditional Middle Eastern rhythms and how to seamlessly switch between them. Dancers will begin by learning to feel the pulse of the music and recognize common rhythms and rhythmic variations while working on ways of expressing these rhythms through dance.